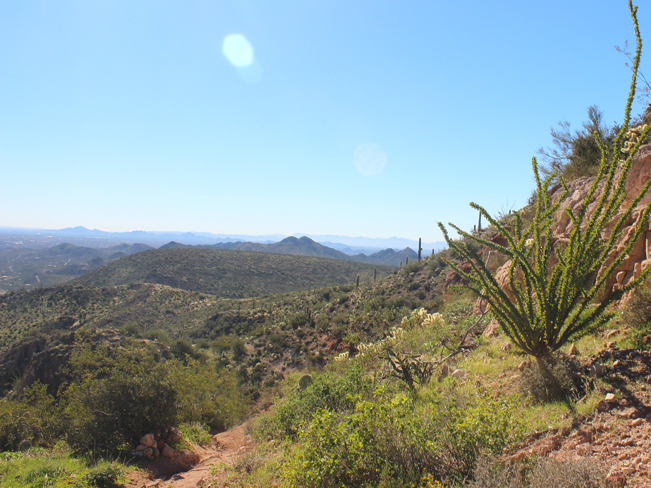 Elephant Mountain Hiking Trail Loop: Phoenix Area "Om"
Get your hiking “Om” on – on this exquisitely beautiful natural trail. 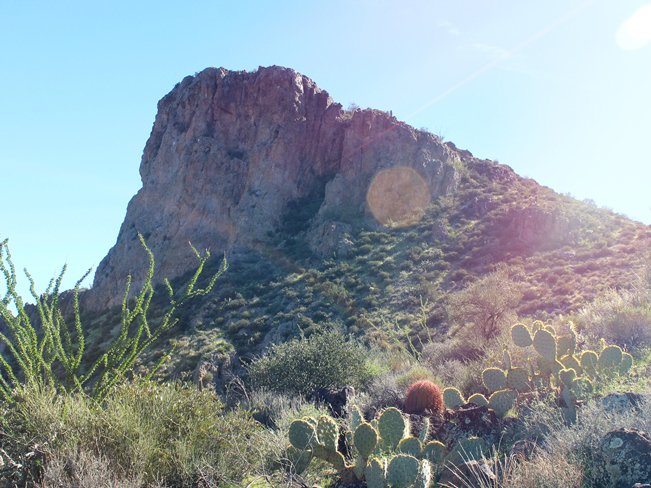 Just a stones throw away from Cave Creek’s rowdy saloon-style cafes, the Elephant Mountain Hiking Trail Loop winds through a vast, pristinely kept conservation area. 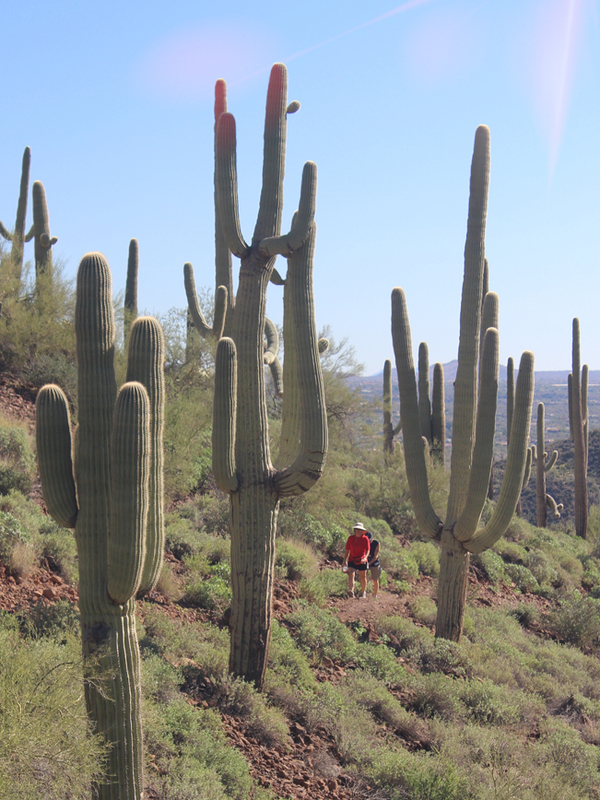 Here echos of the old west resound in the tall buttes, sandy arroyos, ancient Saguaros and hushed tranquility. 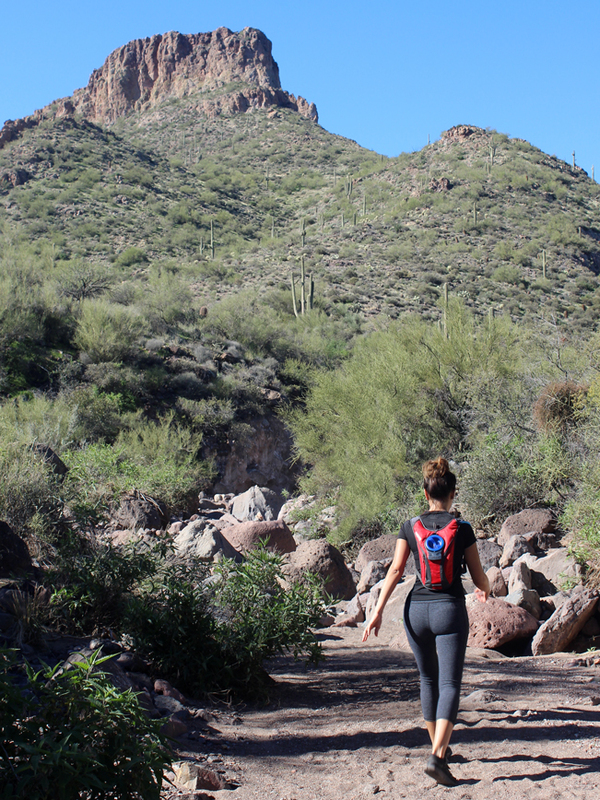 Very few Phoenix area trails can match the gorgeous natural splendor and soothing expanses of Spur Cross’s Elephant Mountain Hiking Trail Loop. 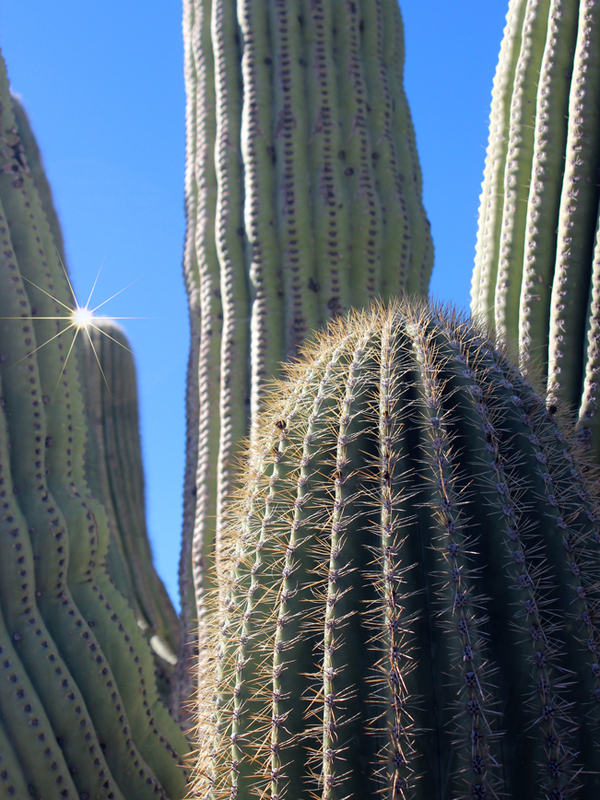 Even though this hike sits just north of Cave Creek’s popular western-style cafes and raucous motorcycle bars, it only takes a micro-second on its protected desert pathways to feel a peaceful “Om” settling in. Driving to the trailhead, past acred ranches and wide horse farms, the city feels way more distant than the ten-miles south it really is. At the dusty parking lot, horses whiney at the riding stable next-door. Expansive views of Elephant Mountain and Table Mesa dominate the landscape. The Elephant Mountain Hiking Trail Loop is a mash-up of the Spur Cross, Elephant Mountain and Tortuga Hiking Trails (see downloadable map for details). This combined 5.4 mile loop circles a promontory on Elephant Mountain’s eastern slope. At its awesome high point, the trail crosses a saddle between a tall stone butte and the upper reaches of Elephant Mountain. Although most of this loop is moderate, the one-mile stretch up to and over the saddle is steep enough to be labeled difficult. It’s the trail angle that earns the ranking. No boulder scrambles or extreme climbs are included on this hike! 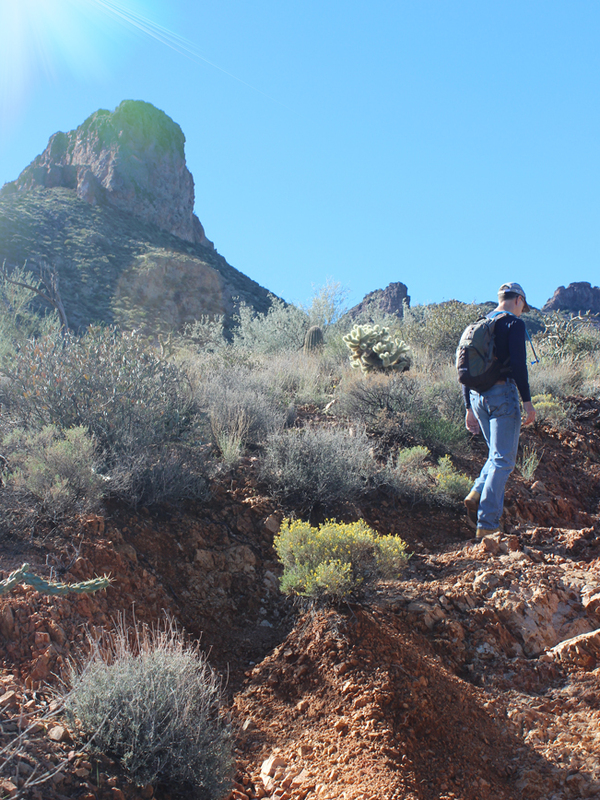 The Elephant Mountain Hiking Trail Loop can be hiked by starting west, on Spur Cross Trail, or east, on Tortuga. Heading west on Spur Cross makes for an easier hike, since the trail’s steepest section ends up being downhill. As a note: if you’re up for the extra uphill sweat required by hiking east on Tortuga, the views in this direction are super sweet! Starting in the more moderate, Spur Cross, direction the trail begins by gently ascending the side of Elephant Mountain. The rocky path is flanked by John Wayne aged Saguaros (way old!). At three miles in, the Spur Cross Trail is intersected by Elephant Mountain Trail. Turning right onto this trail, the loop continues arching and begins to climb towards the saddle in earnest. Views over the area’s mountains take on increasing glory as the trail gains elevation. At the highest point, just before the saddle, a noteworthy drop-off edges the path. Once through the saddle, the trail descends rather steeply. Views back towards the stone bluff are breathtaking! The broad vistas, stillness and quiet bring on a tranquil hiking “Om.” At the mountain base, the path crosses in and out of a soft, sandy arroyo. Keep your eyes peeled for trail cairns here, as the trail is a bit less defined in this section. The Elephant Mountain Trail climbs over one last hill and then terminates at the Tortuga. Turn left here to complete the loop back to the trailhead. Elephant Mountain is named for its silhouette. Viewed from Cave Creek (perhaps while sipping a post-hike beer) the mountain resembles a pachyderm, with a big floppy ear and long trunk. Directions From the intersection of AZ-17 and Carefree Highway, exit 223 (in North Phoenix), head east on Carefree Highway for 10.55 miles to Cave Creek Road. At the stoplight for Cave Creek Road turn left / north and continue for 1.43 miles to North Fleming Springs Road. Turn left / north onto North Fleming Springs Road and drive for 0.78 miles to North Echo Canyon Drive (which becomes North Sierra Vista Road and then North Cottonwood Canyon Road). Continue for 8.47 miles to the intersection of Spur Cross Road. Turn left / south onto Spur Cross Road and continue for 1.2 miles. The parking lot for the Elephant Mountain Hiking Trail Loop is on the right side of the road.